Having the right tools, skills and development approach can make your job so much easier and increase your value within your company. Technology is always changing and experienced IBM i professionals and as well as developers who are new to the platform should take advantage of every opportunity to develop new skills and learn new techniques to do things better, faster and smarter. Join us for a live webinar hosted by IBM Systems Magazine on Wednesday March 8 at 1 pm ET. 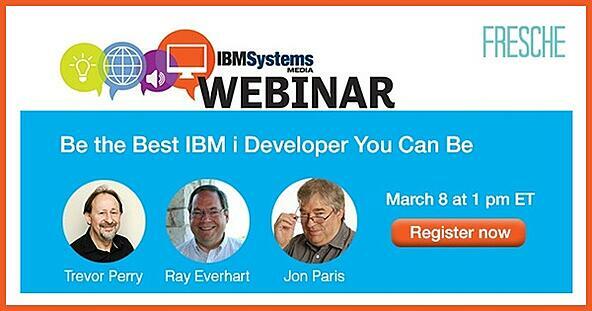 Three of the most renowned IBM i experts - Jon Paris, Trevor Perry and Ray Everhart – will talk about how you can be the best IBM i developer you can be. Hope you can join us and look forward to seeing there!